Gone are the days of wasted paper and expensive 3M products cluttering up your desktop, at least if you adopt a digital version of the concept with Simple Sticky Notes. This program is a desktop application which essentially takes over the task of those sticky notes that have been popular over the past several decades. The program goes beyond simple chicken scratch and provides you with some lovely options. 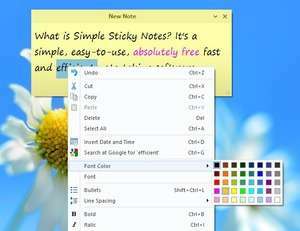 Simple Sticky Notes provides users with customization options such as custom background colors (instead of the default yellow), transparency adjustments and changing the size of the actual note on your desktop. For security reasons, you should also check out the Simple Sticky Notes download at LO4D.com which includes virus and malware tests. Additional screenshots of this application download may be available, too.